Beto O'Rourke launched his presidential campaign with all the grace and apparent preparation of a college student who stayed up all night before a big exam getting drunk at a Guided By Voices cover band concert. Beto's announcement didn't garner as much attention as other prominent Democratic candidates, even after he received a boost from President Donald Trump, who made fun of his "crazy" hand gestures. over the 24 hours since O'Rourke's launch, he was searched less, according to Google Trends, than Sanders, Biden, Warren and Harris. What about fundraising? Beto, who raised almost $80 million during his failed Senate campaign against Ted Cruz, urged supporters in a campaign announcement email to open their wallets because "What we raise in the first 24 hours will set the tone in the national conversation about the viability of our campaign. Several days later, the campaign still hadn't released those crucial figures, and Beto is struggling to explain why. On Monday morning, the campaign announced it raised more than Bernie had in its first 24 hours, which is pretty, pretty good. in Washington, Iowa, @BetoORourke is asked again on whether he will be releasing his fundraising numbers for what's come in since he launched. You could, I pointed out. "You're right – I choose not to," he said. Doesn't exactly inspire a lot of confidence — nor does the fact that Beto's campaign thus far consists almost entirely of vague bromides, usually an appeal to "have a conversation." No bold proposals to imprison billionaires a la Elizabeth Warren. His few actual policy positions appear to have been plagiarized — lifted directly from other candidates. Beto spent the weekend campaigning in Iowa and Wisconsin, where he addressed a crowd in front of a giant poster of the Soviet Union. The candidate continued to regale voters with stories about his "Republican" mom, who has been voting in Democratic primaries for almost two decades, and while attempting to weigh in on the gun control debate, managed to aggravate just about everyone on both sides of the issue. Beto is also trying to split the difference on healthcare. He opposed Obamacare when he first ran for Congress, but supported a single-payer, Medicare-for-all program during his Senate race against Ted Cruz. Now he's "no longer sure" about that. Same goes for his stance on impeachment. O'Rourke said when he was first running for Congress that he was against Obamacare. He said during his Senate campaign he backs for a Medicare for All-type program of single payer health insurance. Since announcing his campaign, Beto has had to apologize for joking about being an absentee dad, among other "ham-handed" quips at his wife's expense, and was forced to acknowledge "the truth of the criticism that I have enjoyed white privilege." Oh, and he also had to apologize for writing a fictional piece about running over a group of children with his car. The "privilege" angle in particular is gaining some steam, and has already produced some unsavory headlines for the Democratic darling of the 2018 election cycle. 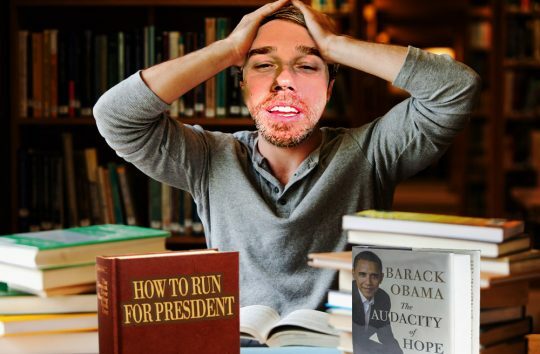 Beto's rivals in the diverse field of candidates are taking notes, especially the ones you already forgot were running. Don't worry, though, Beto still has his champions within the party. Just ask fellow former congressman and failed candidate Joe Crowley, the long-serving member of the House Democratic leadership team who was ousted by political megastar Alexandria Ocasio-Cortez. At least he's got Beto's back in the war against Donald Trump Bernie Sanders. Beto might be off to a rocky start, but the Democratic primary is going to be one hell of a show. Enjoy! This entry was posted in Politics and tagged 2020 Election, Beto O'Rourke, Democratic Party. Bookmark the permalink.